Signs you might have a Food Intolerance? Unfortunately i am one of those people who suffer from intolerance's! As i said in my 'My Story' post, i am intolerant to Wheat, Gluten, Yeast, High Sugars & Cows Milk. Fortunately i can cope with having foods with small amounts of the listed above, but because i want to better myself, i have cut them down substantially. 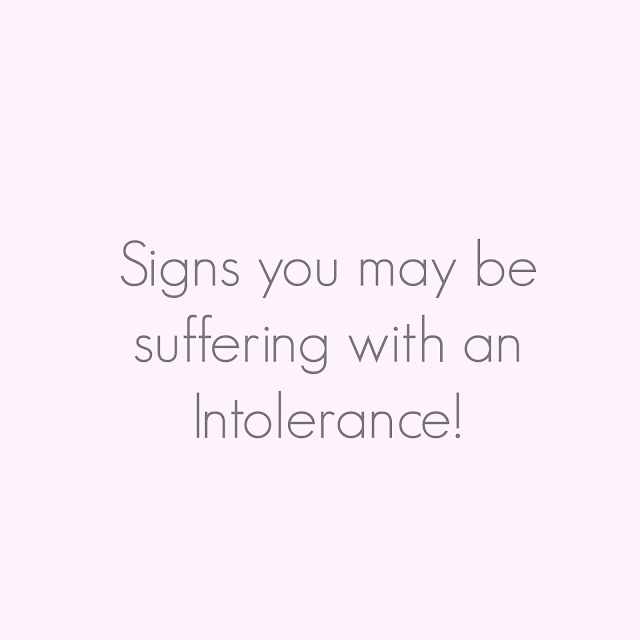 Because i suffer with Intolerance's, i have read up a lot & have quite a bit of knowledge on things you need to look out for..so i thought i would write this post to help you guys out and help you if you think you might be intolerant to foods or are having Signs & symptoms! When i first started to have problems with food a few years back, i was really harsh on myself & eliminated all foods i thought were causing me a problem, leaving me with a very tricky diet. I was eating the same thing day in day out, keeping to (as i liked to say) a safe diet. I was extremely stressed and unhappy, not getting any enjoyment out of food. Its only been until recently i have taken control of my diet and am finding a better range of different foods i can tolerate and am getting more enjoyment out of the food i am eating now than before. At the beginning i found my diet a real struggle and thought it wasn't normal, as i couldn't eat out or on the go, it affected day trips and family meals and i felt pretty miserable about it all. But i want you to know, there is so much hope out there, even if you feel like i did at the beginning. You can read more about my story on my 'My Story' post under the 'About me' link. An Intolerance is an adverse reaction to food and refers to difficulty digesting certain foods in your body. A high percentage of the population are intolerant to Cows milk, so its is more common than you think. 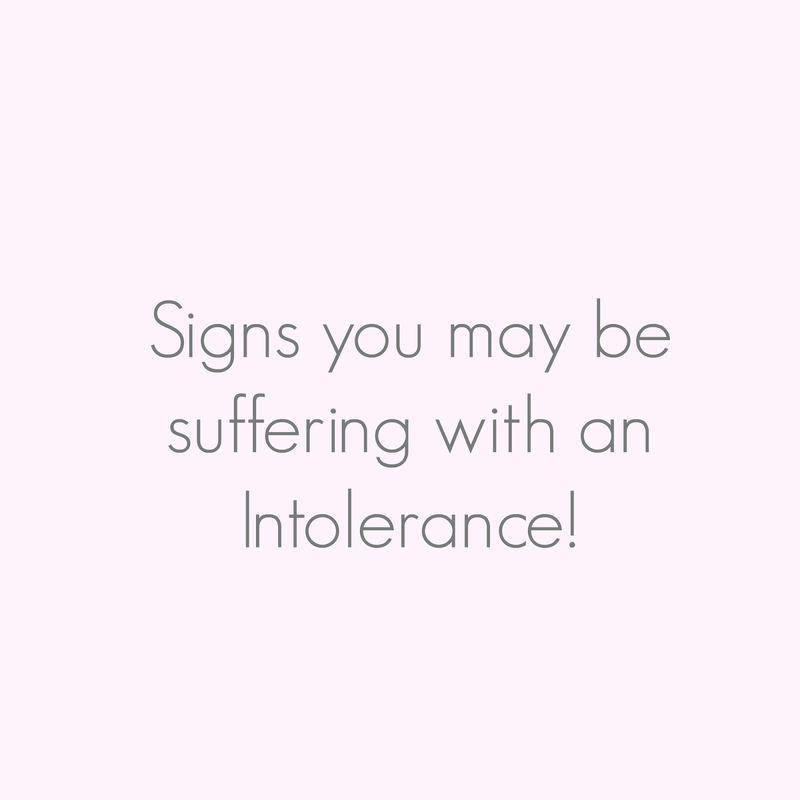 First of all, there are many different signs and Symptoms of having a Food Intolerance. At first reading up about the different sign and symptoms, i was surprised at how many different ones there are! As you can see there are ALOT of signs and symptoms you wouldnt think are associated with a Food intolerance. So... if you are suffering from any of the listed above, its worth thinking about what you eat, and whether you may be intolerant to a food in your diet. If you think you do have a food intolerance, its worth speaking to your Doctor, who can give you some guidance and refer you to see a Dietician. They may also want to do tests e.g. Blood test, Scans, Ultrasounds of the abdomen to rule out any other possible causes! Make sure to follow me so you don't miss out on my latest yummy posts!